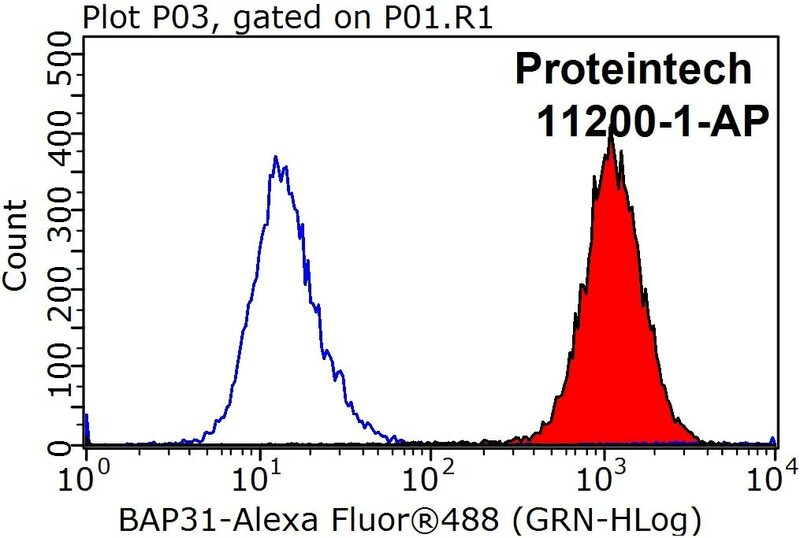 IP Result of anti-BAP31 (IP:11200-1-AP, 3ug; Detection:11200-1-AP 1:1000) with A431 cells lysate 3300ug. 1X10^6 HeLa cells were stained with 0.2ug BAP31 antibody (11200-1-AP, red) and control antibody (blue). Fixed with 90% MeOH blocked with 3% BSA (30 min). Alexa Fluor 488-conjugated AffiniPure Goat Anti-Rabbit IgG(H+L) with dilution 1:1000. 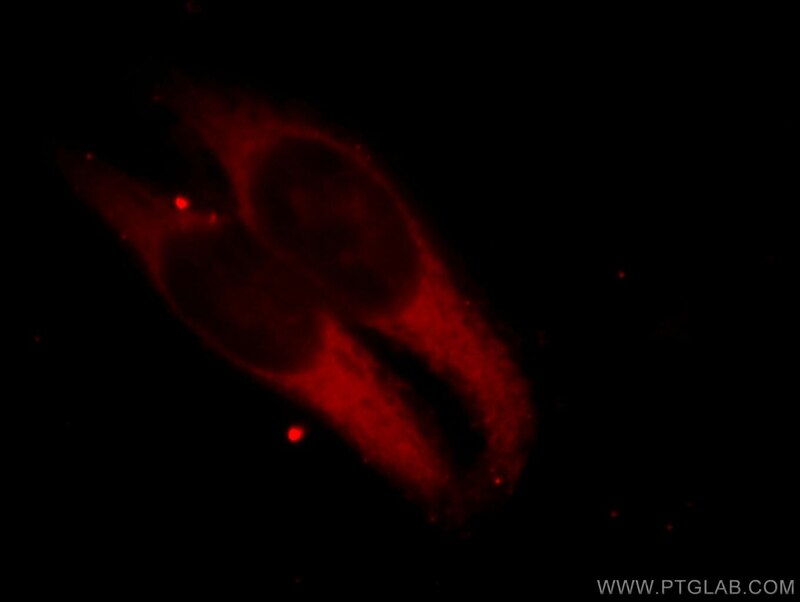 Immunofluorescent analysis of Hela cells, using BCAP31 antibody 11200-1-AP at 1:25 dilution and Rhodamine-labeled goat anti-rabbit IgG (red). 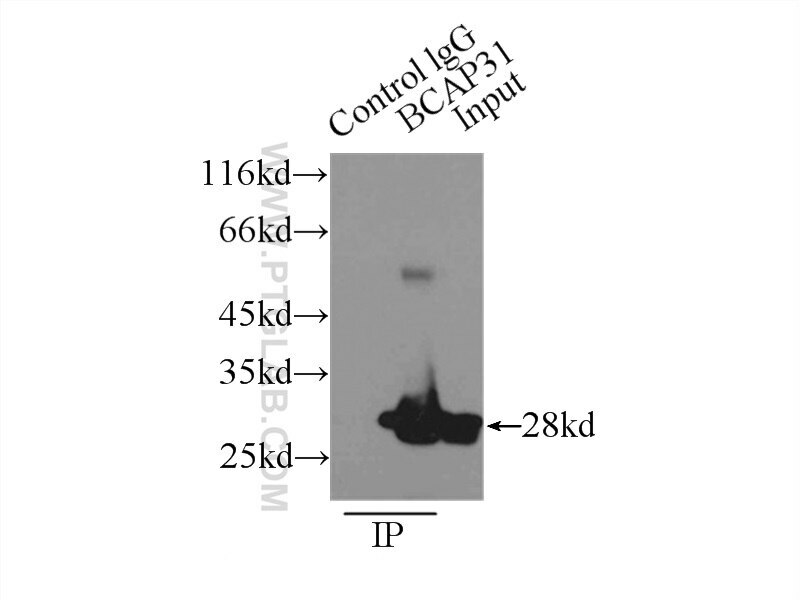 BAP31 is a chaperone protein that is abundant in the endoplasmic reticulum (ER). BAP31 plays a role in the export of secreted proteins in the ER, the recognition of abnormally folded protein and their targeting to the ER associated-degradation (ERAD). It also serves as a cargo receptor for the export of transmembrane proteins. BAP31 may be involved in apoptosis. Fis1 and Bap31 bridge the mitochondria-ER interface to establish a platform for apoptosis induction. 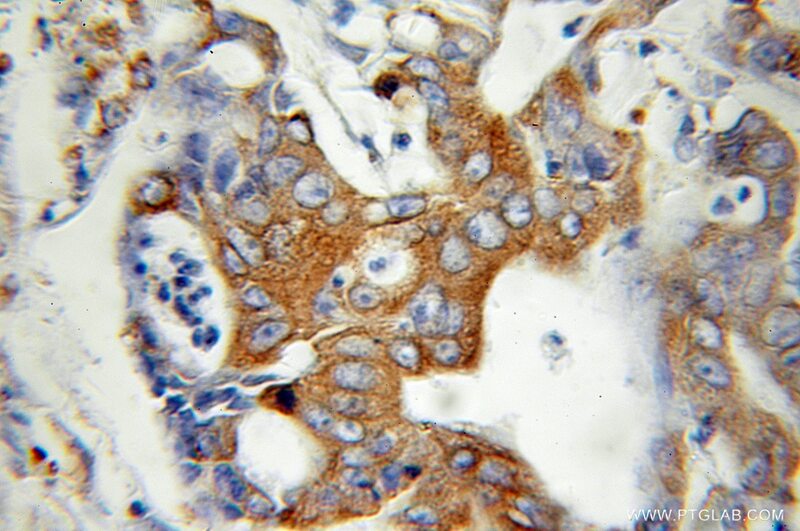 MiR-451a suppressing BAP31 can inhibit proliferation and increase apoptosis through inducing ER stress in colorectal cancer. Expansion of DUB functionality by alternative isoforms: USP35, a case study. Efficient proximity labeling in living cells and organisms with TurboID.